A small exhibition, consisting mostly of dummies & props, illustrating various, mainly mediaeval methods of torture. It's only included on these pages because of a) its location (at one of Vienna's Flaktowers) and b) because it also has a modern supplementary section on contemporary torture, capital punishment and human rights issues. What there is to see: not all that much. 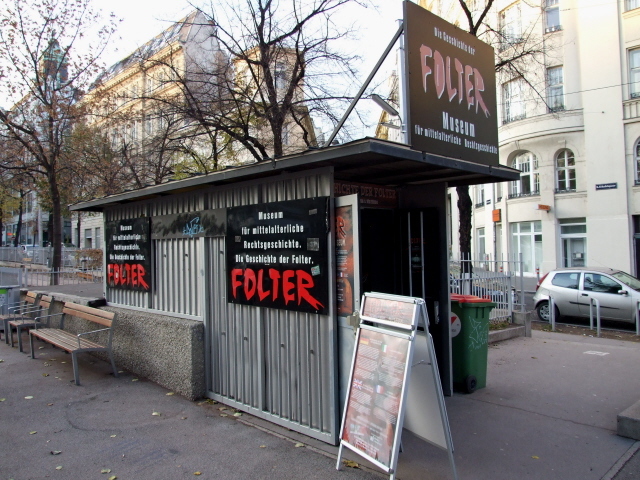 Once you've descended the stairs at the entrance (marked "Folter", the German for 'torture') you come to a foyer area where you buy your ticket for the exhibition. 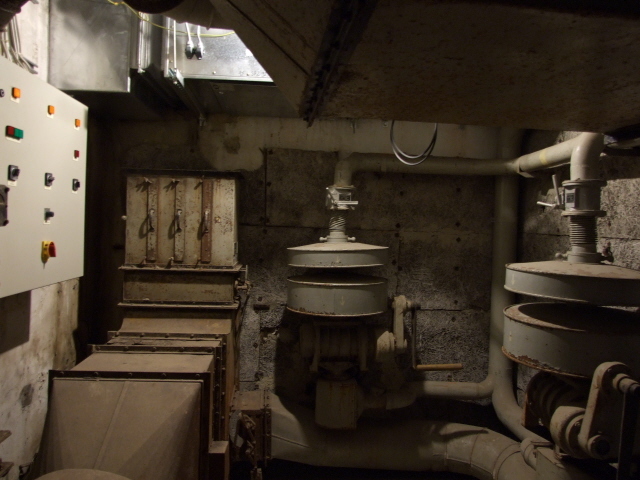 Before entering the exhibition proper you can have a look at some old bunker air ventilation gear in a side room. There are also a few photos and text panels about the bunker's history, its construction and function (with some, though not complete English translations provided). You can even look at these without a ticket for the actual museum. Similarly there is another separate side room for special exhibitions – when I last visited (November 2009), this was on the topic of child soldiers (but all texts were in German only). Before entering the main torture exhibition make sure you pick up an English-language brochure, as all text panels inside are in German only! The exhibition consists of a series of life-size installations with dummies, some with grotesquely exaggerated facial "expressions", accompanied by text panels providing a bit of explanation. These are arranged on both sides of a corridor which leads around a U-shaped concourse of no more than about a hundred yards in total (if that, could be much less … I'm only guessing). Included among the installations is also one on "waterboarding" – which, as we know from the news about Guantanamo, Iraq, etc., is still popular with some great nations that continue to insist on the use of torture (and its propagation in other countries – training and CIA manuals included). Otherwise, the methods of torture depicted are all rather of the mediaeval sort (including the Spanish inquisition), and thus not all that current. Nor is the selection anywhere near comprehensive – just a small indication of humans' ingenuity in devising forms of cruelty towards other humans. There is a certain emphasis on torture in Vienna in the olden days, but it also looks beyond. The style of the exhibition is a bit reminiscent of those in the Dungeon group of "experience" exhibitions – only minus the live "entertainment" factor most of those supply as well. Here you just look at the installations, maybe shudder a bit and/or read the little bits of background info, and before you know it you're almost at the exit. The 6 euros for admission thus appear rather steep for so little. First there is a display (now without dummies) that goes beyond just torture: now it's executions! 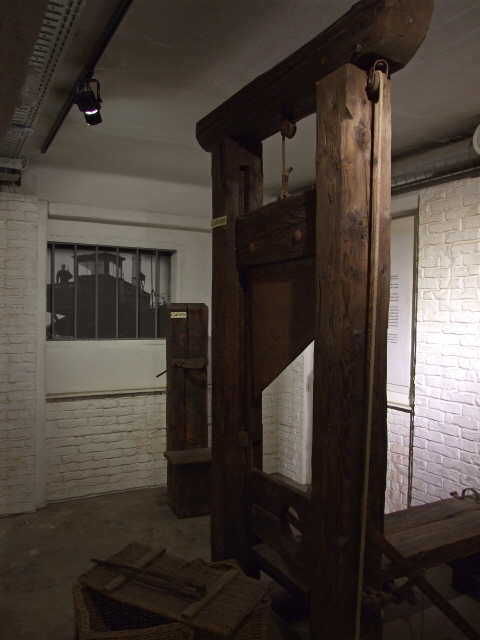 And a guillotine and two types of garrotte (a particularly cruel contraption) thus also take the visitor into the 20th century, as both forms of execution continued to be used in parts of Europe even after WWII (esp. the garrotte in Franco's Spain). 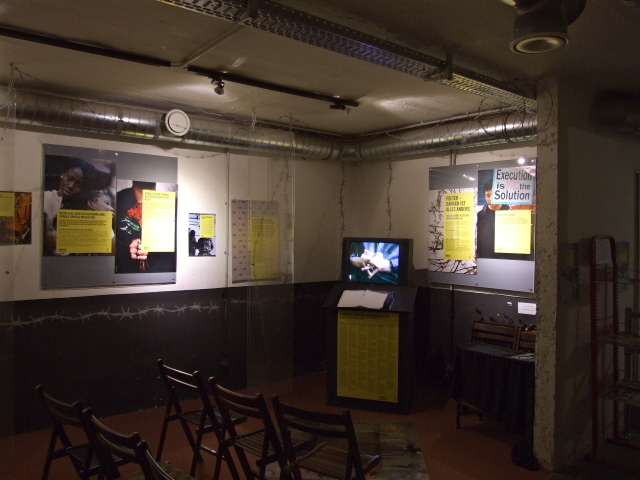 Added on to the actual torture exhibition proper there is a section by Amnesty International. Here it's all about modern-day torture and executions, and instead of life-size displays with dummies, a more intellectual approach is followed using texts, photos and a video screen. The latter shows a series of interviews with former torturers and even politicians (or military commanders? .. it wasn't quite clear) justifying the use of torture … Here it's getting deeply disturbing and very dark indeed. At the till where you buy your ticket there is also a small shop – this sells mostly "spooky" tack (skulls feature a lot), more like Halloween deco, but also a few books. Location: in Esterhazy Park, just north of the Flaktower bunker housing the "Haus des Meeres", between Mariahilfer Straße and Gumpendorfer Straße, in the 6th district of Vienna, about a mile west of the central Inner City. Access and costs: easily reached; a bit overpriced. Details: It's easy enough to get to the museum – it's located just off Vienna's main shopping street Mariahilfer Straße (about halfway up, ca. a hundred yards to the south along the parallel street Gumpendorfer Straße). The bus lines 13A, 14A and 57A go straight past it (the stop you need is "Haus des Meeres"). But you can just as well walk it from the "Neubaugasse" metro station (U3) on Mariahilfer Straße. 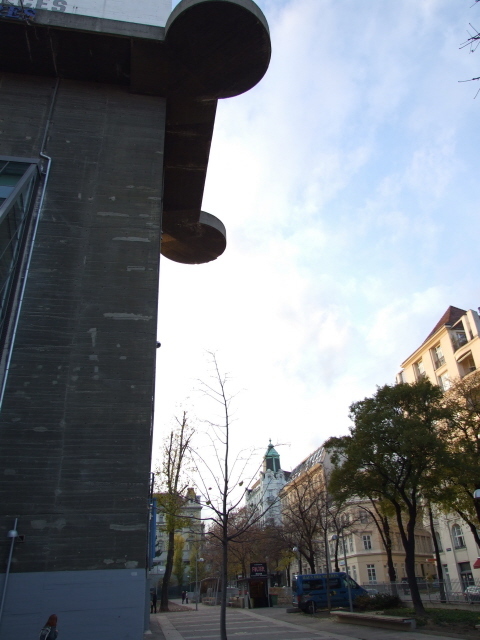 Walking down Schadekgasse or Nelkengasse you will already see the huge hulk of the Flaktower bunker in Esterhazy Park (officially the address is "Fritz Grünbaum Platz 1", but you don't really need to know this to find the place). 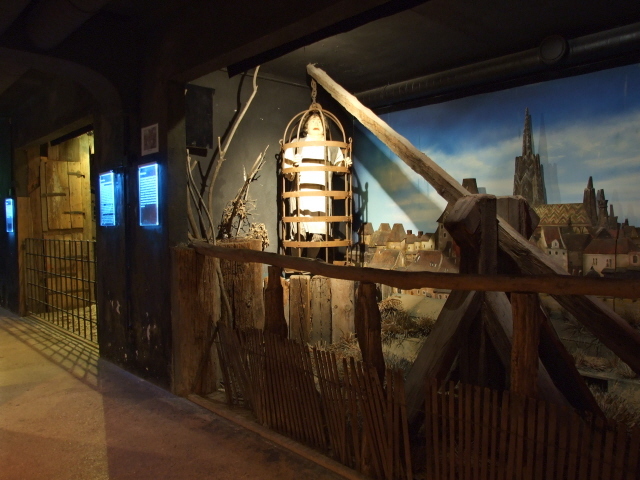 The torture museum is just north of the tower, in a former underground air-raid shelter – the entrance is at a small separate hatch over a stairway leading down. It's marked clearly and colourfully enough in deep red: "Folter" ('torture' in German). NOTE that it is quite cold down there, so in summer especially make sure you take an extra layer to put on! Opening times: daily 10 a.m. to 6 p.m. Combinations with other dark destinations: The location of the torture museum already makes for a dark combination, as it is housed in the basement area around one of Vienna's "Flaktürme", huge former anti-aircraft gun bunkers. This one in Esterhazy Park was the "Leitturm" for the "Gefechtsturm" which is located nearby in the Stiftskaserne army barracks (and is as such not publicly accessible). The Esterhazy Park tower is the only one that is accessible regularly inside – but this has been converted to a "mini-zoo"/aquarium. This does however mean that the roof is also accessible (weather permitting), which is quite unique. Otherwise the structure has been much altered – also on the outside, with large glass annexes and paint. The south and west walls function as a practice facility for climbers. To get a better impression of a Flaktower in something closer to their original state, you'd need to go and see the pair in Augarten park in north-eastern Vienna. 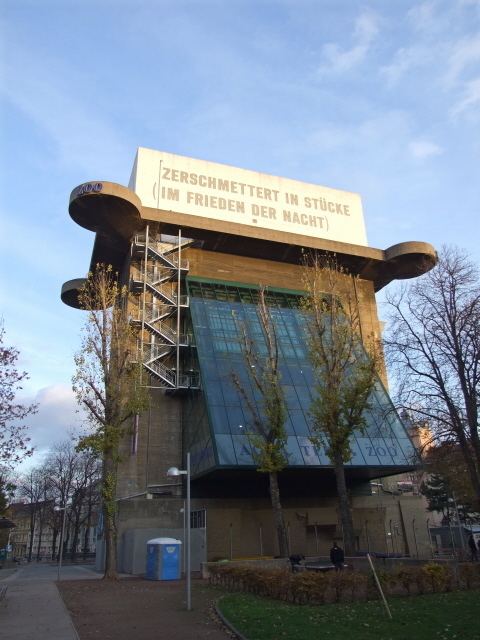 Combinations with non-dark destinations: The torture museum is housed underground right next to one of Vienna's Flaktowers – in this case one that has been converted and made publicly accessible. The inside now functions as the "Haus des Meeres" aquarium and mini zoo, which has become a popular mainstream tourist attraction (opening hours: daily, year round, 9 a.m. to 6 p.m., on Thursdays open late to 9 p.m.; admission 13.50 EUR, various concessions apply, esp. for children). Vienna's principal shopping street, Mariahilfer Straße, is just a stone's throw away. And at its bottom it gives way to Vienna's main museum district, beyond which lies the famous ring road and the touristic core of imperial Vienna, the Hofburg Palace.